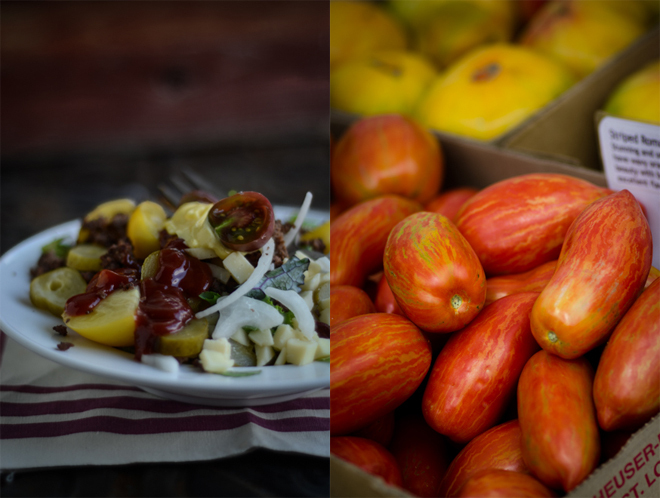 There are many days, particularly in spring and summer when we’re so preoccupied with our work on the farmers market, that I have no time to plan a menu, or prepare an elaborate dinner. We’re hungry. We’re tired. We want something immediately. It’s on these days that I lean on one of my favorite simple, no-fail dinners: Hamburger Salads. Impossibly easy, it’s less a recipe and more a collection of ingredients. In the end, it leaves our hunger satisfied and takes only 10 to 15 minutes of time. To make hamburger salads, you simply need to have a few ingredients – grass-fed beef, raw milk cheese, fermented condiments, greens and tomatoes. Many times, especially in summer, we have these ingredients on hand. After browning the meat, you simply assemble the salad, serve, eat and call it good. Hamburger salads make a blessedly uncomplicated supper, with very few dishes to do afterward. While I often assemble the salads in the kitchen, and serve them at the table, you can also place all the ingredients into separate bowls, and allow your family and guests to assemble their own salads. This method often appeals to children, who appreciate the opportunity to exercise a bit of autonomy in their food choices and meal preparation. Grass-fed beef is the focus point of our hamburger salads – it is a good source of protein, minerals like zinc, B vitamins and it offers a very favorable ratio of omega-3 to omega-6 fatty acids. Moreover, Hamburger Salads lean toward a very light (and fast) supper, and the combination of protein and fat found in grass-fed meat helps to ensure the meal is satisfying, and doesn’t leave you hungry. I typically order my grass-fed meats directly from a local ranch, and you can often find a good source locally through your farmers market; however, if you cannot, you can certainly order it online. I also add raw milk and grass-fed cheeses to our hamburger salads. I prefer cheddar, though I often use Pepper Jack or Monterey Jack cheeses. Grass-fed cheeses, like grass-fed meats, are rich in healthy fats – notably conjugated linoleic acid which offers anticarcinogenic properties. It is also a good source of fat-soluble vitamins. You can find grass-fed and aged raw milk cheeses in many natural foods stores as well as farmers markets; however, I often find it easier to order producer-direct online. I value fermented foods, and, taking a cue from the guidance of the Body Ecology Diet, I try to serve something fermented at every meal. That often means yogurt or kefir at breakfast, or fermented vegetables with lunch and dinner. 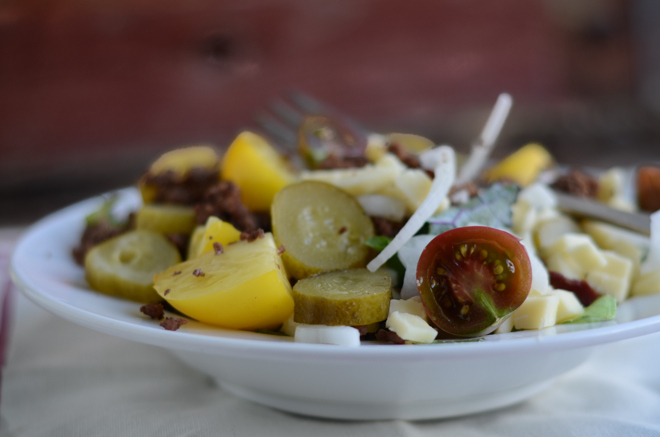 For Hamburger Salads, I tend to add true, fermented sour pickles, though you might add fermented radishes, fermented carrots or any other fermented vegetable that pleases you. In keeping with the flavor profile of a hamburger, I also like to add fermented ketchup and homemade mayonnaise as a dressing for the salad. Lastly, the success of the salad rests on the greens and vegetables you use. The sturdier your greens, the better they’ll stand up to the residual heat of the still-warm, browned meat. I typically add other hamburger favorites to my salads: sliced onion and tomato – but you can add carrots, radishes, cucumbers or anything else that appeals to you. Melt the bacon fat or lard in a heavy skillet over medium-high heat. Brown the ground beef in the hot fat, then transfer it to a serving bowl and allow it to cool about 5 minutes. Plate the greens, then spoon the ground meat over the greens. Top with pickles, cheese, onion and tomatoes, then serve with mayonnaise and ketchup. Consider substituting barbecue sauce for ketchup, or add other vegetables to the salad as suits you. This sounds like a great summer supper, especially on CSA pick up day, as I can have the meat ready to go when we get back with the farm share. I love this idea! It’s especially great because I never have hamburger buns lying around (and it’s hard to find ones that I feel good about eating anyway). Thanks for the recipe! What a great salad idea! Very similar to our taco salads. This will be a nice theme change! I think a homemade thousand island would be a tasty dressing for this(one of our favorite burger toppings). Made with the lacto fermented ketchup and soured pickles it would be extra tasty! Thanks for this recipe! Try a different oil. I use macadamia nut oil and it’s delicious. I often add cumin, and sometimes onion to the ground beef as it is cooking and make a taco salad. I can’t do cheeses because I am allergic, but that would be wornderful too. Bell pepper and avacado also give it a Mexican feel. I’ve been using this tactic with left over spaghetti sauce, and even more since I don’t eat pasta anymore. I put in a lot of ground meat in my sauce so it is chunky and then I fon’t even need a dressing, tho a spritz of balsamic is delish. I have made these for years and love them. For a change, try using scrambled eggs instead of browned ground beef. It’s great. I use a homemade honey french dressing on either of these. Both are so easy, healthy & filing that I make them once or twice a week. Fantastic idea – it’s a deconstructed bunless burger! I added avocado and hard boiled eggs, and used steamed curly kale for the greens. Also fried brown onions in with the beef. I saw this post a few days ago and made my own version of it today. It was delicious! I don’t know why I never thought of it before! Instead of beef, I used garden potatoes. And I got to put my homemade mayonnaise to good use. This is definitely a try-again recipe! Thank you! This recipe looks delicious and easy. I am going to make it for dinner tonight. Do you have any favorite ketchup and mayo recipes to share? I tried to make the ketchup recipe in NT many years ago and it didn’t cone out right. Haven’t tried since. Can’t wait to try this, I think adding some homemade over fries as “croutons” would be yummy too and we love fried eggs on our burgers, then the egg yolk could be your condiment ! Yummoooo can not wait to try it ! !